A teacher’s influence is often a major force in an artist’s career. It continues to guide, shape and inspire long after the time spent in the classroom. 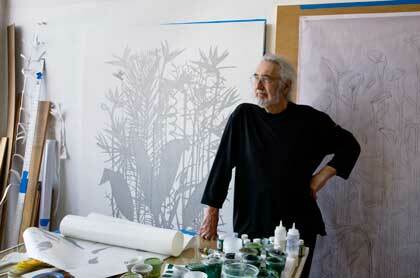 Such a teacher is Roland Reiss, accomplished artist, academic visionary, influential and inspiring mentor. Reiss earned his B.A. and M.A. at UCLA. He was awarded four National Endowment Visual Artists Fellowships and the LA Artcore Lifetime Achievement Award in 1997. His work for 35 years as a professor in the art program at Claremont Graduate University helped to cement that program’s reputation as cutting-edge. On retiring, an endowed chair was established in his name. Reiss’ influence as a mentor has reached deep into the FOTM archives through his numerous students including Matthew Furmanski, Connie Jenkins and Christine Morla. Reiss is in demand worldwide as a lecturer and his exhibits span more than 50 years and many countries. This artist participated in Pacific Standard Time, an initiative of the Getty with arts institutions across Southern California. Reiss’ documentation took place in 2010 and was sponsored by Ojai Studio Artists and Mary and James Galbraith The FOTM Archive contains extensive information about this artist.